Microsoft has finally launched its brand new Lumia 535 smartphone in India. This is the first Lumia smartphone comes with Microsoft label and without Nokia branding. The phone comes with attractive and budget selfie feature with the price range of 9k. Microsoft Lumia 535 comes with a 5-inch qHD IPS display with 960x540 pixels resolution and protected by Corning Gorilla Glass 3. 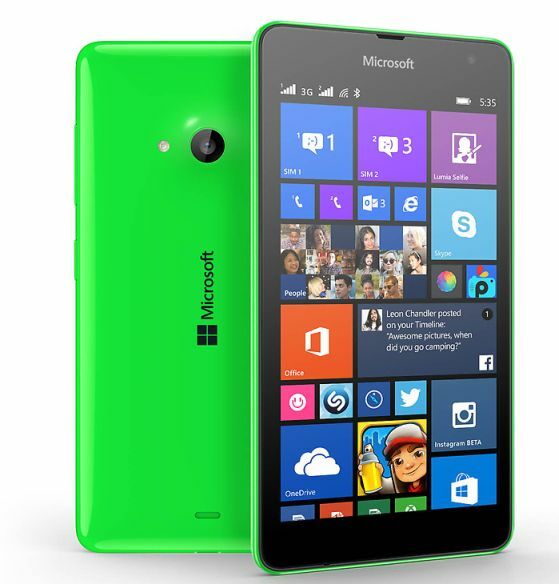 Lumia 535 phone powered by 1.2 Ghz Quad-core Qualcomm Snapdragon 200 chipset with 1 GB of RAM. The phone runs on Windows Phone 8.1 OS and it has 8 GB of internal storage and expandable memory up to 128 GB. It has Dual SIM feature and packed with 1905 mAh battery that provides 11 hours of talk time. The main feature of this smartphone comes with 5 MP rear camera with LED flash and 5-megapixel wide-angle selfie camera at the front. So this is best for selfie lovers in an affordable price. For the connectivity it has 3G, Wi-Fi and Bluetooth. Lumia 535 is priced for Rs. 9199 and comes in three colors. This is the budget selfie smartphone comes with Windows 8.1 OS and will compete with other selfie smartphones like Redmi Note, Lava Iris Selfie. The phone now available on official site and later on all retail stores. Microsoft giving some offers including 500MB of free data for Vodafone, Jabong gift vouchers worth Rs.6000 applicable for three months, and Flipkart ebooks worth Rs 1500.